Ten years after Hurricane Katrina ravaged the city of New Orleans and surrounding areas, NASA is building an innovative storm-monitoring system that could make significant improvements in storm monitoring and warnings. Eight "microsatellites," each slightly larger than a carry-on suitcase, make up NASA's Cyclone Global Navigation Satellite System (CYGNSS) mission. The satellites will orbit the Earth and, together, provide scientists with updates every few hours about developing storms. A single satellite can send updates only every few days, according to a statement from NASA. 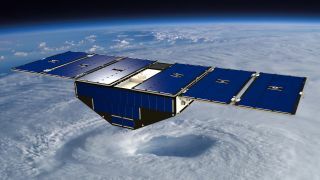 The eight CYGNSS satellites will provide scientists with measurements of wind speed near the surface of the ocean, at the core of various tropical cyclones, typhoons and hurricanes. "These measurements will advance forecasting methods by providing data that can lead to better predictions of hurricane tracks, intensities and storm surges," the NASA website for CYGNSS said. "The ability to better monitor and predict the rapid changes in hurricane intensity, such as those observed with Hurricane Katrina, is critical to hurricane forecasters and U.S. coastal communities." Interestingly, the microsatellites won't actually take measurements of wind speed themselves; they'll collect that data from GPS satellites. This, the mission website said, is what makes the program innovative and cost-effective. Satellites that measure wind speeds on the surface of the earth use a technique called scatterometry, in which a radar instrument shoots a signal at the ground, the signal bounces back and the instrument looks at how the signal has changed. GPS satellites already in orbit around the Earth are already generating those radar signals, so CYGNSS will only receive the GPS signals. According to NASA, building instruments that both send and receive the signals is much more expensive than instruments that do just one of those things. With this approach, the CYGNESS team will create a "new image of wind speed over the entire tropics every few hours, compared to every few days for a single satellite," the mission home page said. The eight satellites will be spread out around the planet, each successive satellite passing over the same location at 12 minutes apart. They will collect signals from multiple GPS satellite constellations. The CYGNSS microsatellites will each weigh about 64 lbs. (29 kilograms) and have a wingspan of about 5.5 feet (1.7 meters) with their solar panels deployed. Assembly of the first satellite is underway, with the other seven to be constructed in the next few weeks, NASA said. The satellites are scheduled to be stacked for testing in early 2016, with a scheduled launch date in late 2016, and science operations set to begin during the 2017 Atlantic hurricane season.